Sports Cards Plus Store Blog: 2014 PANINI PRIZM WORLD CUP SOCCER TRADING EVENT AT SPORTS CARDS PLUS THIS FRIDAY & SATURDAY. WIN $100. TRADE WITH OTHER COLLECTORS. We will buy your Pele, Baggio, Ronaldo, Messi and other Autos. 2014 PANINI PRIZM WORLD CUP SOCCER TRADING EVENT AT SPORTS CARDS PLUS THIS FRIDAY & SATURDAY. WIN $100. TRADE WITH OTHER COLLECTORS. We will buy your Pele, Baggio, Ronaldo, Messi and other Autos. Great customer response on first day of release for 2014 Panini Prizm World Cup Soccer in San Antonio. Everyone who opened a box, loves them. Cards look great and the international buying on eBay will make this a huge success. Even if you don’t know much about soccer, what’s wrong with owning a World Cup Soccer set of the best soccer product produced to date. And, if you don’t care about Baggio, Messi, Ronaldo or Pele Autos, you won’t have any trouble selling them or trading them for something you want. Even the common autos are selling on eBay for $50 or more. Most Autos are in the $100 to $200 range. The Gold Prizms #d/10, Gold Power Prizms #d/5 and the 1/1 with NO AUTO are all selling for real money. What other sports product has that type of value at $108 per box? 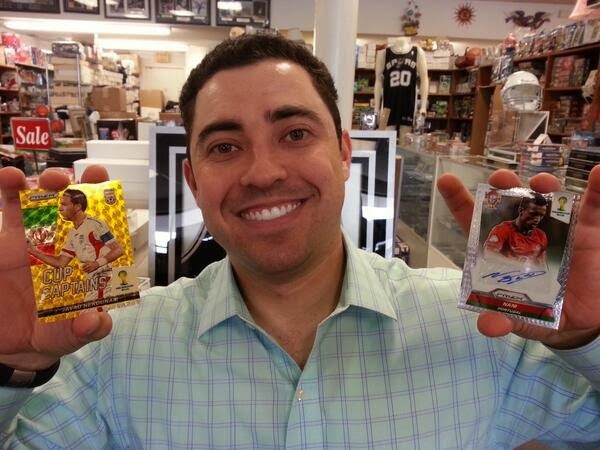 First Day of release was HUGE at Sports Cards Plus. Sergio was the first to pull Super Hits. 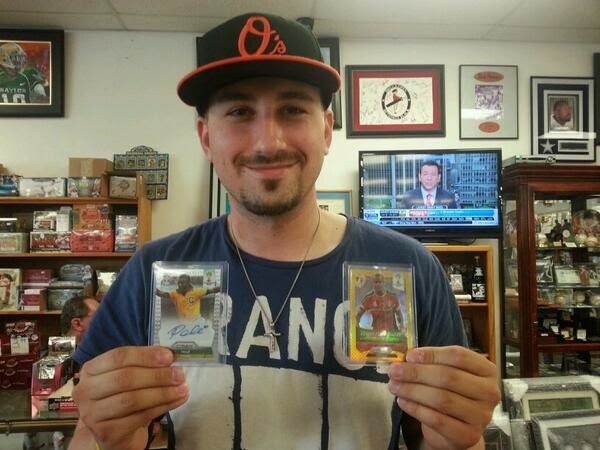 Pictured above is Sergio with his Captain's Cup Nekounam Gold Power Prizm #d/5 and Auto. Next Johnathan came in to try his luck. Here is Johnathan with his PELE AUTOGRAPH and Gold Prizm 4/10. This is a really fun product. So this Friday & Saturday, May 9th 10th we are holding a 2014 Panini Prizm World Cup Soccer EVENT. Trade with other customers. First one to pull a Baggio Autograph in my store WINS $100 (box must be opened in my store), good towards anything in my store. I will buy ANY Panini Prizm World Cup Soccer AUTOGRAPH, Gold Prizm, Gold Power Prizm or 1/1 pulled in my store for at least $30 and for up to 70% of what they sell for on eBay. Don't forget. Our $500.00 Drawing is May 31st. Get a FREE Drawing Ticket with your purchase of $20 or more. Come on in and have some fun.